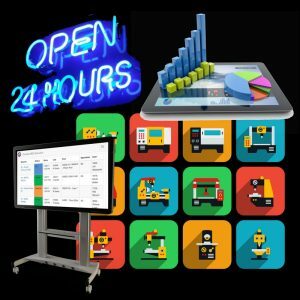 Have you considered lights out manufacturing for 2018? Last year we focused on the economic benefits of lights out manufacturing. Adopting this process may help combat rising electricity prices. There are even more benefits to lights out manufacturing. Goals vary: Manufacturers have different needs to address. Examples – better quality/throughput rates, reduced workplace injuries, and increases production during a skills gap. Enhancing, Not Replacing, Labor: The lower production costs by replacing manual labor can accidentally cause a stigma across the shop floor. But rest assured – this form of automation will not completely replace workers. “Shops do not realize how much they rely on operators,” Peter Zelinski writes for Modern Machine Shop. Successful lights out manufacturing can’t happen without the machinists. Without consulting with operators, errors in the manufacturing process can’t be addressed. They can help pinpoint glitches that can shut down overnight production. Machine Monitoring is Crucial: “There is always the possibility of machine failure, cutting tool breakage, power outages, and other unexpected issues,” Mark Eddy writes for Production Machining. If you are ready to take on lights out manufacturing, get in touch with Shop Floor Automations today! Call (877) 611-5825 or fill out a sales contact form.